My interest in the Bell family stemmed from wanting to know more about my grandmother’s origins. I knew that her mother had died when she was a baby and that she had been brought up by her father’s family, the Rices, in Cam until, at the age of eleven, she had gone to Tortworth, to live with her father, step-mother, and step-brothers and sisters. She had a sister, Elizabeth, who had been brought up by her mother’s parents, but little seemed to be known about them. In 1971, having eventually obtained my grandmother’s birth certificate, I discovered that her mother, Sarah Ann Bell, had been born in Itchington in April 1853. Her parents were John Bell, who was described as a husbandman, and Louisa Bell, formerly Brown. This then led me to look at the 1851 census for Tytherington which showed John and Louisa Bell with three sons, Walter, George and Edward, together with two lodgers, Thomas Hughes, an unmarried agricultural labourer of Itchington, and Charles Reeves, also an agricultural labourer, who had been born in Tetbury. John Bell gave his place of birth as Cromhall, but by the time of the 1881 census he had decided that he was born in Wickwar. By then he had also acquired more children, nine more to be precise. Three of them were living at home. John was now 61 and Louisa, now described as a potato dealer, was 55. The three children living at home were: William, aged 19, Elizabeth, aged 14, and Francis, aged 11. They were also bringing up their grand-daughter, Mary. I now turned to the Tytherington parish registers where I discovered more Bells. In the baptism registers I found the baptisms of John Bell’s three youngest brothers and so found that his parents were called James and Sarah. They had been living Itchington in 1829. James had indeed lived in Cromhall and Wickwar between 1814 and 1827 where he was variously described as a farmer and a labourer, possibly a reflection of the economic situation at the time. The 1839 Tithe Map of Tytherington shows James Bell, John’s father, living at Feoffee’s Farm, Itchington, where he was still living in 1851. The name feoffee is used to describe one of a group of trustees appointed to manage an endowed institution such as a charity school, in this case, I believe, the grammar school at Thornbury. John and Louisa were living next door. Meeting Molly was one of the most important events in researching the Bell family. She was the agent in discovering much of the information about John Bell’s children. Thinking that she had no other Bell relatives still living, apart from her brothers’ and sisters’ children, Molly was surprised and thrilled to discover these distant cousins. We began asking questions!! Since Molly was about 80 when we first met her, it was difficult for her to come up with all the answers we wanted. On one visit to her she mentioned a cousin from Australia who had come to stay with her some years previously and with whom she had subsequently lost contact. The cousin had been a nurse, like Molly, so she decided to write to Manly hospital in Australia where the cousin, whose name was Esma Smith, had worked. Unfortunately by this time Esma had died, but her younger sister, Marian, replied to Molly’s letter which had been forwarded to her by the hospital. Marian told us of a relative called Leslie Allison who was researching the Bell family in Australia and New Zealand. In June 1992 we received the first of many packages from Les Allison who lived in Melbourne. Les died in May 1993, by which time he had sent copies of practically all the information he had on the antipodean Bells who had originated in Itchington. How lucky we were! We now began to build up a picture of those who had emigrated from Itchington to the other side of the world. In the early and mid-nineteenth century assisted passages helped to colonise the new settlements in South Africa, New Zealand, Australia and Canada. In 1834 the Poor Law (Amendment) Act provided for the passage of poor families to the colonies at the expense of the Poor Law Unions. It was probably under this scheme that the migration of the Bells began in 1854 when Joseph Bell, younger brother of John, together with his wife, Elizabeth, who was born in Westport St. Mary, Malmesbury, sailed from Plymouth on the 6th October and arrived in Sydney, three months later, on 5th January 1855. They had married in Bristol less than one month before sailing. They were to have thirteen children of whom the fifth son, John, was Les Allison’s grandfather. On arriving in Australia, Joseph and Elizabeth Bell moved to the Singleton area in the Hunter River Valley about 160 kilometres north of Sydney. Here they stayed until their tenth child, Lewis, was born in 1870. Their eleventh child was born at Brundah Creek, near Grenfell, New South Wales in 1873. (Lewis was a common name in the Bell family and some of you may remember the visit of the County Archivist, Mr. David Smith, when he recounted the story of the death of one Lewis Bell in an accident at Lodge Farm, Alveston. He was in fact a son of John and Louisa). 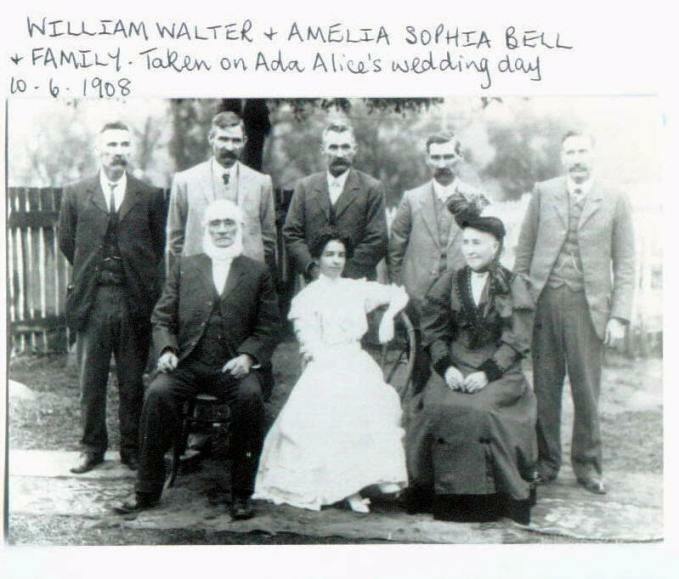 By now Joseph and his family had been joined by his younger brother, William Walter Bell who had married Amelia Sophia Stinchcombe of Alveston. I think she lived in Shellard’s Lane which seems to have been a favourite haunt of Bells looking for husbands and wives. On 12th February 1860 William and Amelia Bell, together with their two sons, William and Walter, sailed from Liverpool, arriving in Sydney on 13th July, a journey lasting five months. They eventually settled in the Brundah Creek area, near Grenfell, sometime between 1870 and 1873. 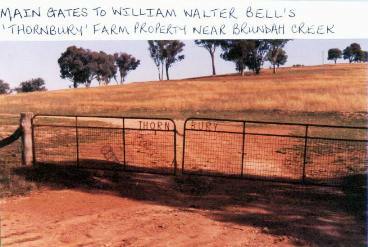 William Bell seems to have been the first person to settle in that particular portion of land and it was known as the “Thornbury” farm. He owned about 100 acres and also mortgaged surrounding properties from the Bank of Australasia. The original Thornbury farm consisted of about 1600 acres. His brother Joseph came with his family to help run the farm and together they became known as the “Beardy Bells” to distinguish them from other Bells. In the 1890’s the Thornbury farm failed as a result of several years of drought combined with plagues of rabbits and kangaroos, added to which periodical bush fires destroyed standing crops. The Bank foreclosed on the mortgage and took over William’s original property. By 1899 all the Bell families had left Brundah Creek. Joseph and Elizabeth’s families had moved to Melbourne and William and Amelia to a smaller farm-holding nearer Grenfell where they started a pig-farm. Amelia died in 1915 and William in 1922. Meanwhile back in Itchington, two of John and Louisa Bell’s daughters, Maria, who was born in 1860, and Emma, born in 1865, emigrated to Australia in 1883. Two young women of 22 and 18 respectively could not travel alone, so John Bell’s brother, James, and his wife, also called Emma, sailed with them. They were both aged 58. By the time that the ship arrived in Sydney on 13th January 1884, James’ wife had died. Having safely delivered the girls, James returned to England alone. He died in the Thornbury Union Workhouse in 1902. Maria and Emma both married cousins. Maria married Richard Bell, son of William and Amelia, and Emma married Joseph, son of Joseph and Elizabeth. No photographs of Joseph and Elizabeth exist because in 1857, some two years after arriving in Australia, Joseph converted from the Church of England to the Christian Israelites, a sect based on the teaching of John Wroe. (who featured in the series, “Mr. Wroe’s Virgins” on the BBC in 1993). Apparently, male and female members of the sect were required to go to church functions and worship wearing the type of clothes worn in John Wroe’s day. Both men and women wore long hair and men had full beards. The beliefs of the Christian Israelites did not permit them to have their photographs taken. Maria and Richard had seven children but Emma and Joseph had none. However they did acquire their niece, Elsie, eldest daughter of Frank Bell, and Molly’s eldest sister. Elsie, remember, had attended Tytherington school in the early 1900s before her family had moved to the Forest of Dean. In about 1912 Elsie was taken for a “holiday” to Australia by her Aunt Elizabeth. Aunt Elizabeth did not bring her home! Aunt Elizabeth was a rather formidable lady by all accounts. She was the eleventh of the twelve children of John and Louisa Bell and was baptised in Tytherington in 1867. She attended Tytherington school and eventually trained as a nurse at Bristol General Hospital, where she worked as a Staff Nurse from March 1889 until June 1890, and as a Sister on Theatre and Female Surgical wards until March 1894, when she entered private nursing. This would involve nursing people in their own homes as those with money would not dream of going into hospital. Operations often took place in drawing rooms or other suitable rooms of large houses and the nurse had to prepare the room, as well as assist the surgeon and then take care of the patient. It was a rather nomadic existence and perhaps accounts for Elizabeth’s later difficulty in staying in one place for very long. At this point she evidently moved to London where she came into contact with Dr., later Sir Frederick Treves. Sir Frederick was a renowned surgeon to both Queen Victoria and King Edward the Seventh. He also treated John Merrick, otherwise known as the Elephant Man. In 1902 when the King was taken ill with peritonitis, and operated on by Sir Frederick, Elizabeth was sent for to assist. For some reason she did not go, but for many years she kept the telegram which had been sent to her. She was one of the first British nurses to go to Austria and Switzerland to accompany home skiers who had broken their limbs. By 1911 she was running a boarding house in Weston-Super-Mare. It was called “La Belle”. Later, after her mother’s death in 1917, she married a man called Henry Acworth and they ran a private school on the Wirral in Cheshire. After her husband’s death during the Second World War, she returned to her roots and lived for a while in a little cottage in Thornbury, near the Council school. She never really settled anywhere though and spent time with various members of the family until she died in hospital in Gloucester in 1956 at the age of 89. She had kept in touch with her sisters and cousins in Australia by visiting them and this she did on three occasions by working her passage as a ship’s nurse. It was on one of these visits that she took her niece Elsie on the one-way trip to Australia. Poor Elsie ended up living with Joseph and Elizabeth, the Christian Israelites. Molly’s mother said that Elsie’s letters often consisted of little more than passages of scripture. However she did eventually marry and returned in 1919 to be married at Littledean church as her father was by now farming at Baynham Farm, Littledean. After her marriage, Elsie returned to Australia where a daughter, Nancy, was born but little more is known of her. Molly was also instrumental in helping us discover what had happened to the eldest members of John and Louisa’s children. Between 1847 and 1851 three sons had been born to the Bells but we knew nothing of what had happened to them. Their names were Walter, Edward and George. I knew from information given to me by Roger that Edward’s daughter, Emily, had attended Tytherington school between 1885 and 1886 and that she had previously attended Earthcott school Early in 1993, Molly received a letter from someone called John James. He was researching his family tree and was writing to ask her for help, as his mother had been a Bell before she married. We eventually discovered that George and Edward Bell had both been miners. 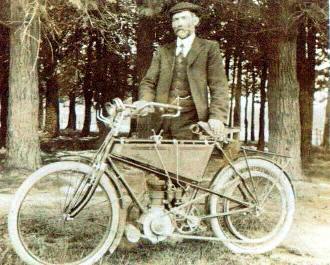 Edward, who was born in 1851, had married Elizabeth Judge of Alveston (Shellard’s Lane?). They had nine children, of whom the eldest was Emily. She was born in Darfield, Yorkshire in 1878. This was part of the Yorkshire coalfields and Edward had obviously gone there in search of work and returned at some point to Tytherington where Emily had gone to school. Eventually they too had gone to live in the Forest but in the 1881 census were living in Alveston. Their grandson, Oliver Wicks was for many years Classics master at Marling School, Stroud and still lived in the area. (Oliver died in 1999). Edward’s brother, George, married Emma Louisa Woodman who, according to the 1891 census was born at Patchway. They went to live in Ruspidge, Cinderford, and produced ten children. George was a collier and haulier, later building up a business, taking people out in wagonettes and brakes. His grandson was the John James who wrote to Molly. (Photo right shows Arthur Alexander Bell, son of William & Amelia, who went to live in New Zealand which is where the photo was taken). Of the eleven children who made up my great grandmother’s siblings I now know something about all but three. The eldest, Walter, who was baptised in 1848, Mary, baptised in 1857 and William John, baptised in 1863. The process has taken me over 30 years and been rather like doing a jigsaw puzzle to which I had only some of the pieces. However, other people had pieces too, not only the previously unknown relatives, but others like Roger Howell and the late Mr. Greenway of Tortworth, who helped me to discover that the Bells had been leading lights in that parish in the eighteenth century, but that’s another story!